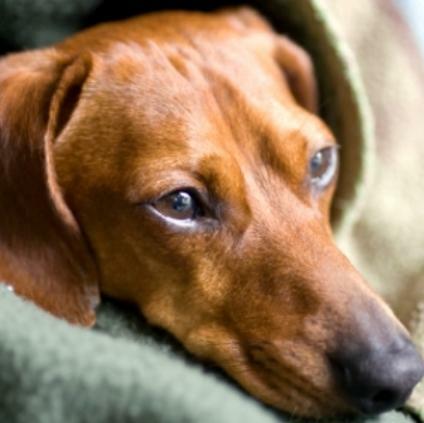 A case of kennel cough produces symptoms that are similar to a common cold. Get tips on what you can do to make your dog more comfortable and to ease the symptoms homeopathically until the illnesses passes. According to Vet Info.com, steam treatments can be a valuable aid in the fight against a respiratory infection. You can create your own temporary sauna by running your shower on its hottest setting and letting steam build up with the bathroom door closed. Once there is good water vapor built up in the room, bring your dog in and let him breathe in the steam for a good twenty to thirty minutes. The steam actually helps the bronchial tubes open up as it simultaneously loosens the phlegm clogging your dog's airways. As a result, your dog is able to bring up more phlegm when he coughs, and phlegm removal is essential to helping him feel better. Be sure to towel off your dog very well to prevent him from feeling damp and chilled after the treatment. You can provide additional relief for your pet via steam by giving him a vaporizing treatment three times a day. Run a hot shower in your bathroom and let the steam build up with the door closed. Take your dog into the bathroom and let him breathe in the steam for 20 minutes. The vapor will help open his bronchial tubes, which in turn makes his coughs more productive. This will enable your dog to rid himself of more of the phlegm clogging his airways. Plantago lanceolata: Plantago is a well known herbal remedy in the homeopathic community. It's an all around cough treatment that acts as an expectorant to help your dog cough up the mucous, as well as an anti-catarrhal to prevent mucous production. This in turn eases inflammation of the bronchial tubes and provides your dog a measure of relief. Echinacea purpurea: Echinacea is regarded as an immune system booster that fortifies the body's fight against cold and flu. Furthermore, it can provide additional support to the immune system after an infection until your dog is 100% recovered. Bryonia C6: Bryonia works double duty to moisturize irritated mucous membranes as well as clear mucous out of the system. 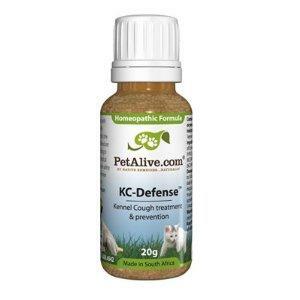 KC Defense - This remedy is designed to relieve a hacking cough and clear congestion for easier breathing. Primalix KC - This is an herbal extract formula for kennel cough. Respo-K - This formula is designed to bring relief for respiratory infections, open up airways to make breathing easier and boost the immune system. Newtom Homeopathics Cough-Asthma - This remedy is formulated to relieve coughing and ease breathing. HomeoPet Nose Relief - Although this remedy isn't specifically sold for kennel cough, its combination of all natural ingredients is formulated to relieve the symptoms of an upper respiratory infection. It's important to understand that many homeopathic remedies will not improve your dog's symptoms immediately like conventional medications are designed to do. However, you should begin to see improvement over several days as the remedy builds up in your dog's system with repeated doses. Make sure you follow the directions on the label of any remedy you choose to try. It's also very important that your dog's surrounding environment is healthy. Keep your dog away from damp floors. Refrain from smoking in the house. Scrupulously clean the areas your dog comes in contact with the most to limit his exposure to germs. Clean off your furnace or air conditioner filter to remove more dust from the air. Frequently clean and refresh his food and water bowls. Wash all of his toys in hot soapy water and rinse well. Try to isolate your sick dog from the others as much as possible. Feed and water him from his own bowls, and don't allow your other dogs access. Wash your hands thoroughly after every encounter with the sick dog. In fact, wash your hands before you touch him to prevent transferring opportunistic bacteria. You are more attuned to your dog's health than anyone else. If your dog appears to have any type of illness, it is up to you to judge whether a trip to the vet is in order. While kennel cough can go away on its own, your dog could actually have another condition that requires professional medical intervention. A visit to the vet is often well worth the trip. Your vet can confirm or rule out that your pet has a viral respiratory infection, and test for the presence of other respiratory bugs. A vet may prescribe antibiotics in order to treat a secondary bacterial infection or prevent one from developing. While this won't kill the original virus, it can dramatically improve your dog's symptoms. A vet might also decide to use aerosol therapy or a bronchodilator to help open the airways. Use your best judgment to make sure your dog gets the help he needs.